Last week I wrote about asparagus. 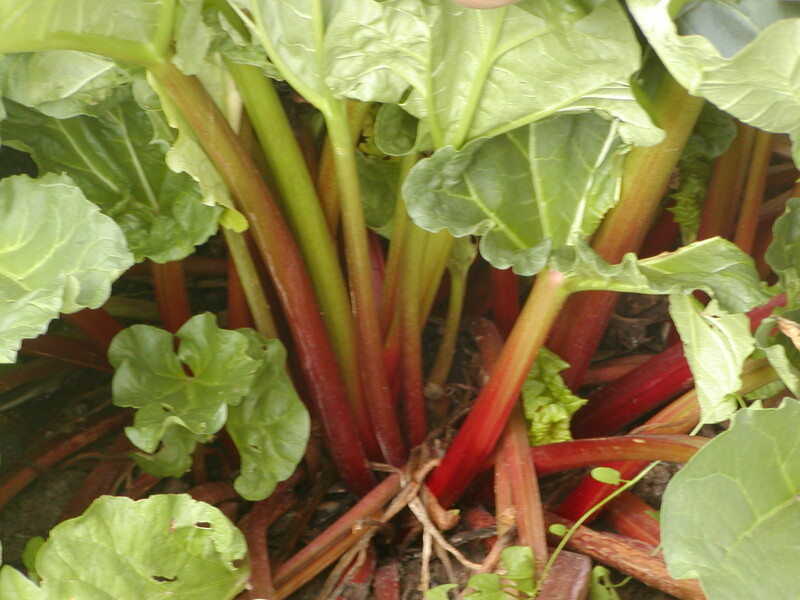 Rhubarb (Rheum rhabarbarum) is another perennial vegetable that requires little care. Few people grow it around here. Likely, it’s because our hot summers take their toll on it. You have to pick the right place for your patch or you’ll not be successful. This past winter was harsh, but it was a great winter for rhubarb. It grows best where the ground freezes and temperatures remain below 40 degrees. This spring I have an impressive crop of healthy thick reddish stems. Last year it struggled. Consequently, rhubarb is more common in the coldest parts of the country. We can grow it here, but it requires some protection from the hot afternoon sun. That can come from a well-placed tree or some taller annual or perennial plants. The problem is that rhubarb is a sun loving species. Your goal is to protect plants from extreme heat while giving them ample light. Harvesting before the third year might stress the plants. But after that time stalks may be cut freely. Make sure not to remove more than about a third of the stalks at any one time. Cutting too many weakens roots for the next season. Early spring growth seems to have better flavor and texture than that harvested later in the year. The part of the plant you eat is actually called the petiole, which is part of the leaf. Harvest them as close to the ground as possible either by pulling them or cutting them off with a sharp knife. Remove the leaf blades and use the petioles in your favorite recipes. I consider maximum high quality shelf life less than a week. After that you should either freeze or can your rhubarb. When you see flower stalks, cut them off close to the ground. They rob the plant of energy. Beds will need to be divided every six to eight years. Do it when plants are dormant or at least haven’t grown very much in the spring. I love a rhubarb pie mixed with fresh strawberries. A big bowl of rhubarb sauce is a treat too. If you’ve never eaten it before and you have a sweet tooth, be ready to use copious amounts of sugar. Rhubarb stalks are very sour but they have a delightful flavor once you get past that. 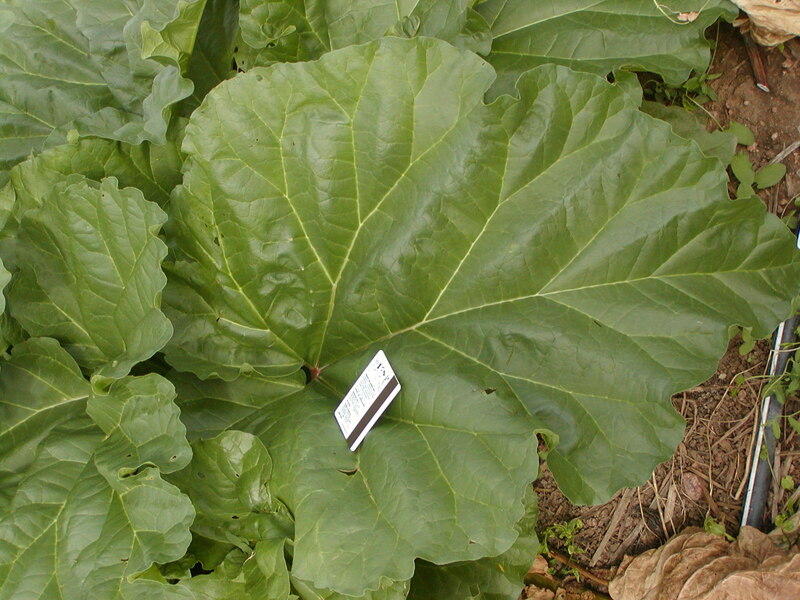 Some people use preparations of rhubarb roots to treat many digestive problems and cold sores. Roots are a potent stimulant laxative. Only older mature plants should be used as removing roots weakens general plant health. Leaf blades should not be consumed as they are very high in oxalic acid and can be especially troubling for people who form oxalate kidney stones. Chemicals in rhubarb roots also interfere with some anti-inflammatory medicines, most notably corticosteroids like prednisone. Root extracts also can interact with many blood thinning medicines. Keep that in mind when sources discuss rhubarb for medicinal use they are most likely discussing root tissue. The stalks contain very little medicinally. They just make a great pie. This entry was posted in foraging and tagged cold tolerant, petiole, pie, potent stimulent laxative, rhubarb, root extracts, sour flavor. Bookmark the permalink. Although you’re quite right (as ever) that it goes better with some cold times, we can grow rhubarb well enough here in Sydney with no frosts and summer temps above 100 on a good few days. For us, there are some varieties that deal with warm climates better. Being something that side shoots can be taken from, finding someone with a good strain for the area is a good way to go. I grow mine next to (in a terrace just above so not root-competing) the asparagus bed so that it gets full sun in winter, but shade in summer that increases up to maximum amount in the hottest couple of months. That’s wonderful news. I’ll have to do some research. I’ve always dug a few clumps from my parents’ place in Maine and that strain would certainly be more adapted to cold. I get a few years out of it before the summer heat and humidity melt it out. If I could get a good patch growing here it would be great!